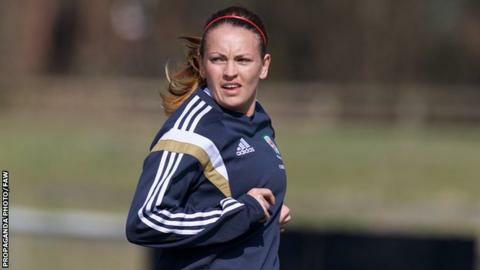 Kayleigh Green and Helen Ward both scored twice as Wales women beat Kazakhstan 4-0 to keep alive their Euro 2017 qualification hopes. Green fired home from Natasha Harding's cross to open the scoring before doubling the lead on 23 minutes. Ward scored Wales' third from the penalty spot after Green was fouled by Begaim Kirgizbaeva, who was sent-off. Reading striker Ward converted a second penalty with nine minutes remaining after Jess Fishlock was fouled. Wales' remaining three games are all at home, including matches against Norway and Austria. Kazakhstan are bottom of the group and Wales were 4-0 winners when the sides met in Haverfordwest in November. The other two group runners-up will play-off for the final qualification spot.